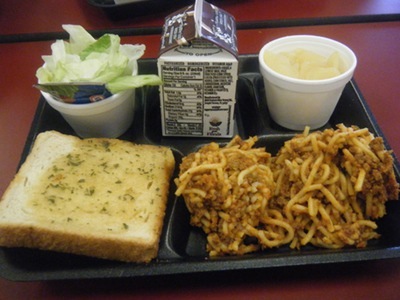 Contents: Spaghetti with meat sauce, garlic bread, salad, salad dressing, pears, chocolate milk. Notes: Spaghetti for school lunch almost always tastes good. One of the "safe" bets. Seriously gross. That's not what spaghetti is supposed to look like people. Looks worse than canned Chef Boyardee to me. I am a 13 year old girl who actually unlike you adults who say it looks delicious I have to eat this stuff spaghetti for school lunch tastes terrible. do they honestly call that garlic bread? and why is milk served with every single thing they should have options of water or juice that is free! I go to desoto county schools and our school lunch is terrible the only thing I ever eat at school when I don't bring my lunch is fruit otherwise I throw the whole tray of food away they should ask kids opinions on this food before they start assuming that every one is gonna eat it. I have started bringing my lunch everyday now and school lunch is one of the reasons my parents will be sending me to private school for 9th through 12th grade.